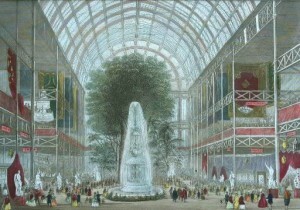 The building of the Crystal Palace, as it was nicknamed by Punch magazine, together with its grand opening, provide a stunning background for the Victorian strand of House of Glass. 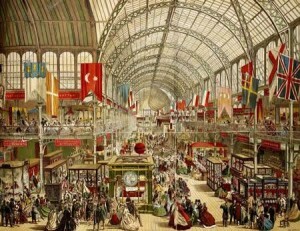 This enormous building was designed to house The Great Exhibition of the Works of Industry of All Nations held in 1851. The initial idea for the exhibition came from Prince Albert, Queen Victoria’s consort. He had realised the potential of global trade at a time when the market for mass-produced goods was becoming more competitive. Modelled on successful French national exhibitions, the Great Exhibition was the first international display of manufactured goods. It had a huge effect on the course of art and design throughout the Victorian age and beyond. 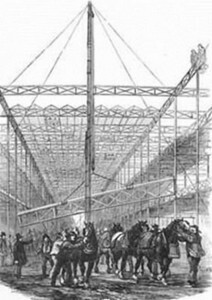 The construction of Paxton’s innovative design. Prince Albert encouraged the government to set up a Royal Commission which would oversee the exhibition to be held in Hyde Park, London. The Commission received over two hundred architectural submissions for the Exhibition Hall and rejected every one of them in favour of their own plan. This in turn was universally condemned as ugly and too expensive. Time was running out when another plan emerged, this one from Joseph Paxton, based on buildings he had created for the Duke of Devonshire’s estate. Paxton’s innovative design used modules of glass and iron that could be fabricated off-site and in due course taken apart again, since the building was to be only temporary. Essentially it was a giant greenhouse, made of identical, interchangeable pieces, thus keeping the cost of materials relatively low. Paxton’s design was at first rejected and then after public pressure, adopted with the addition of a dome, to allow it to incorporate several very tall trees in Hyde Park. Work began on 1 August, 1850 and by December more than 2,000 men were working on the site. The building took only nine months to erect, thanks in large part to the ingenious machines that Paxton invented. There was one, for example, to help put up the thirty miles of guttering outside the building and one to fix the huge number of glass panes. Eighty men could fix over 8,000 panes of sheet glass in a week. When completed, the main building was 1,848 feet long and 408 feet wide, enclosing 772,784 square feet (19 acres), an area six times that of St. Paul’s Cathedral and about the size of five modern football pitches. The building was like nothing anyone had ever seen before, an Arabian Nights palace of glass glittering among the tree. It struck an immediate chord with the population, and enough tickets were sold in advance to ensure that the exhibition made a profit even before it was opened by Queen Victoria on 1 May, 1851 – on time and in budget. The Queen herself became a frequent visitor. The Exhibition Hall housed some 100,000 objects, displayed along more than ten miles, by over 15,000 contributors. Britain, as host, occupied half the display space, with exhibits from the home country and the Empire. The biggest exhibit was the massive hydraulic press that had lifted the metal tubes of a bridge at Bangor invented by Stevenson. Each tube weighed 1,144 tons, yet the press was operated by just one man. Next in size was a steam-hammer that could with equal accuracy forge the main bearing of a steamship or gently crack an egg. There was a printing machine that could turn out 5,000 copies in an hour of the popular periodical, the Illustrated London News, a machine for making the new-fangled cigarettes, and an expanding hearse. There were folding pianos convenient for yachtsmen, and a useful pulpit connected to pews by rubber tubes, so that the deaf could hear the service. An entire gallery was devoted to early versions of the bicycle and the elegant carriages that came before the motorcar. The exhibition’s primary aim was to showcase the best of British design and manufacture, but exhibits from across the world flooded in.The largest foreign contributor was France, sending magnificent tapestries, Sèvres porcelain and silks from Lyons. The visual impact of the French display was stunning, and showed France to be a serious competitor in the markets on which Britain prided itself. India contributed an elaborate throne of carved ivory, a coat embroidered with pearls, emeralds and rubies, and a magnificent howdah and trappings for a Rajah’s elephant. Chile sent a single lump of gold weighing 50kg and Switzerland sent gold watches. The Russian exhibits were delayed by ice in the Baltic but, when they arrived, they were astonishing. They included huge vases and urns made of porcelain and malachite twice the height of a man, and furs and sledges and Cossack armour. At first the price of admission was £3 for gentlemen, £2 for ladies but from 24 May the masses were let in for only a shilling a head. And they came in their thousands: factory workers sent by their employers, villagers from the countryside, crocodiles of schoolchildren. The travel agent, Thomas Cook, arranged special excursion trains. Saturday mornings were reserved for invalids. There was a police desk for lost children and umbrellas. The famous fountain in the middle of the building, twenty-seven feet high and four tons of pink glass, became a useful meeting place. No alcohol was sold, but Messrs Schweppes provided light refreshments. Tea, one of the most expensive products of the time, was outsold by coffee fourteen to one. And for the first time ever, ‘waiting rooms and conveniences’ were provided, where visitors could spend just one penny and enjoy a private cubicle. By the time the exhibition closed on 11 October, over six million people had gone through the turnstiles and a profit of £186,000 had been realised. Most of this was used to purchase land in Kensington where several museums were built along what was named Exhibition Road, including the forerunner of the Victoria and Albert Museum. In addition, the Queen commissioned a statue of Prince Albert sitting under a gilt canopy opposite the Royal Albert Hall, with a copy of the exhibition catalogue on his knee. The Crystal Palace was dismantled and reassembled in Sydenham, South London. There it stayed as a tourist attraction until it burned down in 1936. The Palm House at the Royal Botanical Gardens at Kew is the nearest we have today to this extraordinary building.